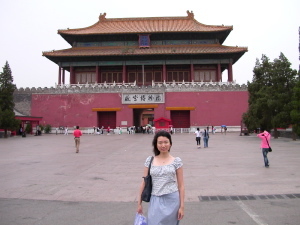 Danna is both a native Mandarin speaker, a Chinese national, and has lived in Beijing before. It is extremely unlikely that future exchange students will have such a valuable resource at their disposal. Hopefully this document will answer many of the questions you have, but it is unlikely that your first few days on the ground in China will go as smoothly as ours did. This was no trouble at all. The magic word to remember is "Tsinghua". All Chinese know it and combined with your student Visa will speed you through customs. I as a non-Chinese national actually got through immigration faster than Danna, as they have separate lines for non-residents. Customs was also a breeze for both of us. The Chinese laws are pretty standard, one bottle of booze, one case of cigarettes, etc. I didn't bring anything at all to declare. The only rule you might have to worry about is the maximum amount of cash you are allowed to bring which is $5000 US Dollars worth. If you have lots of luggage, you will need a cab. Otherwise you can take the bus from the airport which is cheap and safe. Plan in advance, it is really hard to find a good, short-term apartment after Aug 15. And impossible to find a one-bedroom apartment as they are in short supply. But the dorms are nice and safe if you do not mind living in a small room. all within the approximately 12m^2. selection, and a meal including a soda is about 7-9 Yuan. call someone who can translate over the phone. the station (8-10 Yuan) or to any other place you might want to go. classes, fencing, also takes place there. Almost all the students who live off campus live in the same housing complexes in Wu Dao Kou which are called: Hua Qing Jia Yuan, Dong Sheng Yuan or Shui Qing Mu Hua Yuan. If you live off-campus, after finding your apartment, negotiating an agreement, you must register with the local bureaucracy so the Chinese government can keep track of were all the aliens are living. This is a relatively painless process, your agency and landlord will likely accompany you, all you have to do is be patient and bring your passport. This is a slightly time consuming process. It also requires over 500 Yuan in cash so be sure to bring enough money when you register. Registration takes place on the second floor of one of the dormitories. These are located in one extreme corner of campus. It is a considerable walk from the dorms to the MBA Office. The campus, like Beijing itself, is constantly under construction, but the campus is much cleaner and nicer the nearer you get to the East gate. The area around the dormitories is dull and dusty and can provide a bad first impression if you arrive to register by taxi then walk across campus to the MBA Office like we did. Even if you do not stay in dormitories it may be worth your while to buy a food card. This allows you to buy food at the cafeterias and saves you from carrying cash. There are vending machines, which accept 5 Yuan and 10 Yuan bills as well as coins. You can purchase sodas and snacks at these vending machines on your breaks. The MBA Office staff is quite friendly and helpful. Their office is located on the second floor of the School of Economics and Management Building. This building is also referred to as the Weilun building. Onward to Section 3: Beijing - 北京 or return to the introduction.